If we were to give an exhaustive account of the benefits of the recitation of “Bismillah…” we would need more than a single volume to do justice to it. Apart from being part of every chapter in the Holy Qur’an (except the chapter of repentance [surah at-tawba]), it is also the most often repeated verse in the Holy Qur’an. It is also mentioned that recitation of “Bismillah…” with a loud voice is from the signs of a true believer. 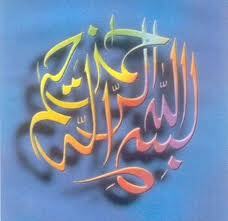 Imam Ali Ridha (a.s.) said that “Bismillah…” is very close to the chosen name of Allah (s.w.t. )[Isma A’adham]. Muslim Center Supports Call to Help Rebuild America!